A well presented and deceptively spacious 4 bedroom and 2 reception room, bay fronted, mid terraced house with a good sized kitchen / family room and off road parking to the rear. This gas centrally heated (from combi boiler) and uPVC double glazed property comprises, on the ground floor, of cloakroom, bay fronted living room with open fireplace, dining room and that good sized kitchen / family room to the rear. On the first floor are the 4 bedrooms and bathroom having a white suite. Subject to gaining the usual planning consents, the loft could be converted to provide further living accommodation if required. There is an easy to maintain garden to the rear which can also be utilised for enclosed, off road parking for 1 vehicle. 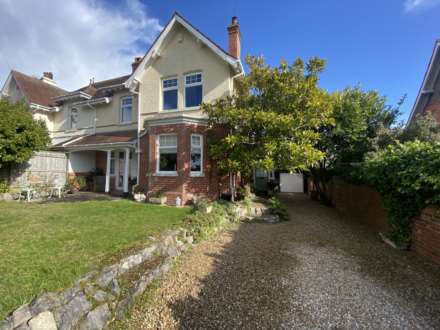 Handy for Exmouth Town Centre, Train Station, Phear Park and Schools, an appointment to view is strongly advised. Modern fitted white suite comprising low level WC and wash hand basin. Dual aspect having window to rear and window to side and double glazed external doors to rear garden and balcony. Good range of matching cupboard and drawer storage units with Solid Oak work surfaces, matching island incorporating breakfast bar. Stainless steel single bowl sink unit with mixer tap. Range style cooker with filter hood above. Space and plumbing for dishwasher and washing machine. Further space for fridge / freezer etc. Cupboard housing the gas fired combi boiler supplying the central heating and domestic hot water. Radiator. Laminate flooring. Obscure glazed window to side. White suite comprising panelled bath with thermostatically controlled shower unit over, tiled to ceiling height. Low level WC. Pedestal wash hand basin. Heated towel rail. Tiled flooring. Extractor fan. Walk - in bay window to front, further window to front. Radiator. Picture rail. Window to rear. Fitted shelved storage cupboard. Radiator. Picture rail. There is a small area of Front Garden with a walled boundary and pathway to the front entrance door. Outside gas meter box. The enclosed and easy to maintain Rear Courtyard Gardenis laid to brick paving with double wooden gates, from the rear, giving access to the Courtyard and provides enclosed, off road parking for 1 vehicle. Raised decking area accessed from family room. Brick walled boundaries. Outside water tap. Outside power points. From our prominent Town Centre office, proceed down Rolle Street, past The Strand Gardens and turn right at the mini roundabout into The Parade and on into Exeter Road. Just before The Park Hotel on the right, turn right into Lawn Road where the property will be found on the left hand side, clearly identified by our For Sale sign.